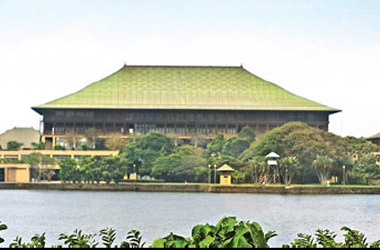 Parliament sittings were suspended for 10 minutes at 12.55 pm yesterday after Opposition member Dinesh Gunawardena took away the Mace alleging that the Chair had been biased towards the government in allocating time for them to speak. When the name of Rehabilitation, Resettlement and Hind Religious Affairs Minister D.M. Swaminathan was called by the Chair to address the House during the adjournment debate moved by the government on the Geneva based UNHRC resolution, NFF Leader MP Wimal Weerawansa rising a point of order said that the Chair had been partial in giving time to government members. MP Wimal Weerawansa said that the time of the floor had been continuously to government members, neglecting the speakers from the opposition listed to speak. Presiding Member Mujibur Rahman said that he was calling the names in the order of a list given to him. He said that Wimal Weerawansa's name was at the bottom of the list. At this stage MP Dinesh Gunawardena stated that it was not fair to give opportunity to government members. He added that Minister Patali Champika Ranawaka and Minister Mahinda Samarasinghe spoke from the government side. The next opportunity should be given to the opposition. At this stage, Minister Mangala Samaraweera stated that when the Chair gave the opportunity to a member same cannot be questioned. At this stage Dinesh Gunawardena stated that it was the duty of the Chair to protect the rights of the MPs. At this stage the presiding member said that Minister Samarasinghe was given the opportunity from the time allocated for the UPFA. By this time a tense situation had been created due to members from government and opposition sides were shouting at each other. to take away the Mace Deputy Sergeant-at-Arms attempted to prevent it. MP Gunawardena surrounded by MPs Jayantha Samaraweera, Piyal Nishantha, Udaya Gammanpila, Sriyani Wijewickrama, CB Ratnayake, Rohitha Abeygunawardena, Sisira Jayakody and Indika Anuruddha led the mace to the middle of the Well while the Deputy Sergeant-at-Arms got hold to it. At this stage the presiding member announced that sittings would be suspended for 10 minutes. Presiding member Rahuman suspended sittings and hurried to the Well. He was seen arguing with Opposition MPs that he did nothing wrong but was following the order in list given to him. Ministers Eran Wickremaratne and Mangala Samaraweera were seen trying to calm the situation down calling on the opposition MPs and MP Rahuman to ease up. Deputy Serjeant-at-Arms Fernando took the Mace from MP Gunawardena and others and replaced it in its position . When sittings resumed at 1.05 pm, MP Gunwardena got up and said that he was not aware of the order of the list given to MP Rahuman and expressed his regret and requested to grant the opportunity for Weerawansa to speak. The proceeding continued and MP Weerawansa was permitted to speak and Minister Sawminathan's name was shifted two places down.